Wayne State University Press, 9780814318874, 288pp. 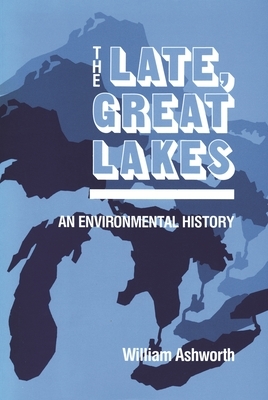 The Late, Great Lakes is a powerful indictment of man's carelessness, ignorance, and apathy toward the Great Lakes. With the longest continuous coastline in the United States, they hold one-fifth of the world's freshwater supply. Author William Ashworth presents a compelling history of the Great Lakes, from their formation in the Ice Age, to their "discovery" by Samuel de Champlian in 1615, and, finally, to their impending death in our time. Ashworth systematically deals with the wild life that once flourished in the region-beaver, salmon, whitefish, and trout-and describes the threatening elements which have displaced them-the predatory sea lamprey, the alewives, toxic waste, and volatile solids. William Ashworth, one of our leading writers on environmental subjects, is the author of several books on water-resource politics and the American water crisis, including Nor Any Drop to Drink (1982). Mr. Ashworth lives in Ashland, Oregon, and in 1982 received the first annual Award for Outstanding Achievement from the Oregon chapter of the Sierra Club.